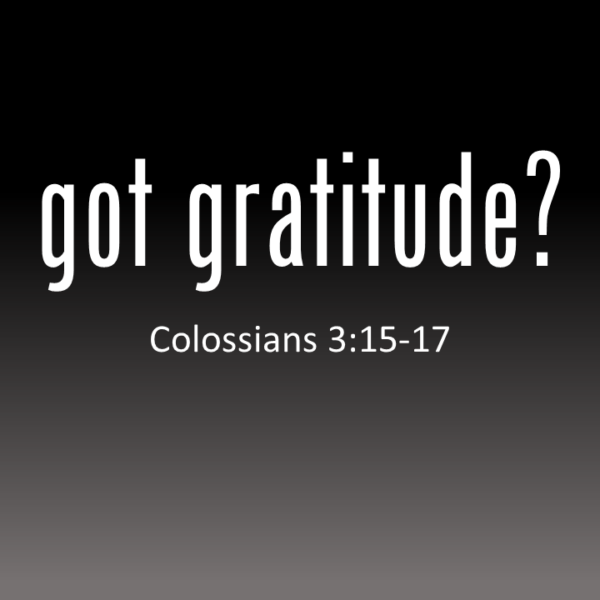 Home › Sermons › got gratitude? The real Christian life is not a list of dos and don’ts. It’s not keeping track of how many times you read your Bible and prayed. It is not how much money you gave, many classes you taught, or casseroles you baked. It is bringing glory to God through everything you do because you are so thankful to God. It gets our eyes off ourselves, and helps us to focus back on God. It reminds us we’re not in control, but that we serve a Mighty God who is. It keeps us in a place of humility and dependency on Him, as we recognize how much we need Him. It helps us to recognize we have so much to be thankful for, even the little things, which typically we forget to thank Him for…but actually they are often the most important things in this life. It takes our attention off of our problems and helps us instead to reflect on, to remember, the goodness of His many blessings. It reminds us that God is the Giver of all good gifts. We were never intended to be fully self-sufficient in this life. A grateful heart reminds us that ultimately God is our provider, that all blessings and gifts are graciously given to us by His hand. A heart of gratitude leaves no room for complaining. For it is impossible to be truly thankful and filled with negativity and ungratefulness at the same time. A grateful heart finds peace in Jesus Christ, is filled with God’s Word, can’t help but sing about it, and focuses everything thing back on the glory of God.